Alpitye Art Studio specialises in certified Aboriginal artworks, purchased directly from the artists. We guarantee all artworks shown on our website are authentic with provenance assured. We supply signed and dated Certificates of Authenticity and fully detailed profiles on the artists. We understand that buying over the internet without physically viewing the painting can be a little daunting. We would like to reassure you that it is important to us that you enjoy purchasing paintings from our website. We guarantee that we will fully refund the cost of the artwork if you are not happy. You must notify us within 24 hours of receiving your purchase if you intend to return the painting; you need only to pay for the cost of the return freight. The painting must be received by us in its original condition with its accompanying documentation for the guarantee to apply. Once we have been in contact and your order has been processed a confirmation email will be sent to your nominated email account. Your painting will be sent immediately using Australia Post premium services or TNT Global express services. All un-stretched artworks and documentation are packed to a high standard and are sent with Australia Post premium services or TNT Global Express, allow 3-7 working days for delivery. Insurance is optional, however highly recommended. Please make sure the delivery address you nominate or a representative will be available to accept the parcel and sign for the package. Otherwise you will be left a calling card informing you how to collect your package. If you receive any damaged goods please contact us immediately. Any paintings returned to us damaged will require a restoration fee. All artwork prices listed by Alpitye Art Studio are GST inclusive. International buyers are exempt from the Australian GST and need to contact us for further information. If other duties and/or taxes apply specific to the overseas destination then the buyer is liable for these charges. These charges are non-refundable on return of goods to us. All prices are in Australian Dollars AUD $AUD. We accept most forms of payment. We do not accept traveler’s cheques. The most common form of payment is by credit card or paypal. Please contact us to purchase using Visa, Mastercard and Bankcard, or use the payment cart on site. For all purchases, your order will be dispatched upon receipt of payment. Buying a piece of artwork is a very personal matter. It is important to us that any artwork that you buy is something you will enjoy. Though we take every step to ensure our artwork images have the exact likeness to the paintings, we understand it is not always the case and images are not the same as viewing the artwork in person. Our guarantee is that we will fully refund the cost of the artwork if you decide not to keep it within 10 days of receiving it. Please return it to us within the 10 day period, upon receipt of the artwork we will issue you the refund. Please determine what duty or tax you may have to pay to your Government for the import of goods ordered from us. Please notify us if there are any special requirements to assist customs clearance. 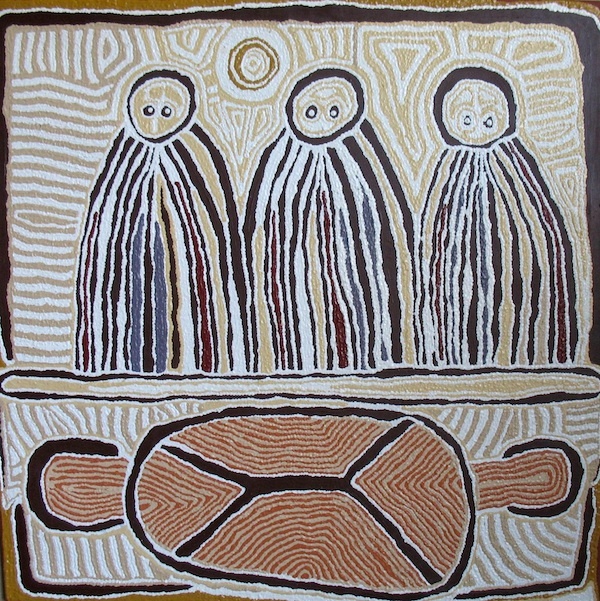 Alpitye Art Studio specialises in authentic Aboriginal artworks. All Aboriginal artworks are purchased directly from Aboriginal artists ensuring we secure the best quality, authentic Aboriginal art. All aboriginal art sold by Alpitye Art Studio is accompanied by a Certificate of Authenticity and Artists Biography. By using our website you agree to be bound by the terms and conditions presented on this website including the information conveyed in these online sales guidelines for buyer and seller conditions. If you have any concerns on the above terms and conditions please contact us at via email, phone or fax. All material provided on the Alpitye Art Studio website is copyright protected. Copyright for the artworks shown on this website belong to the artists. They may be viewed and downloaded only for the purpose of buyer browsing. No reproduction of any image shown on this site may be made for any reason whatsoever without the artist's permission. You may use this material for your own personal reference only. Copyright for all images not of artwork on this website belongs to Alpitye Art Studio Gallery and may not be reproduced in any part without the permission of Alpitye Art Studio and the associated artists. You may not use any part of the material on the Alpitye Art Studio website to establish, maintain or provide, or assist in establishing, maintaining or providing your own publications, Internet site or other means of distribution. All information on this website has been written and collated by Alpitye Art Studio in association with the artists and their families. It has come from years of knowledge, experience and passion. If you would like to reproduce or copy any content (information or images) from this website we would appreciate it being used with reference to Alpitye Art Studio and with our permission.